from The Essentials of Italian Cooking, p. 152. Five years ago or so, I spent a few days in Palermo, Sicily. It wasn’t at all hard to find good places to eat. On aside street near the state archives where I was working, I found a small family-operated trattoria that provided me two good lunches two days in a row. On the first afternoon, I ordered pasta with eggplant in a tomato sauce. The server — a shy, young woman who was the daughter of the cook — brought me a plate of penne covered with a thick sauce. When the taste of mint unexpectedly exploded on my taste buds, I must have looked surprise. My server, who was waiting to see how I liked my food, said, “Do you like it? We add mint to our sauces.” Her attentiveness to my reaction made me wonder if the addition of mint represented a radical experiment on the cook’s part. Or was it typically Sicilian? She really couldn’t say. But she gave me the impression that the cook like to experiment with flavors that were common in Sicilian cooking. Since then, I’ve tried to incorporated mint into tomato sauces with eggplant and had mixed results. This time, I think I nearly succeeded. The only drawback of the plate of pasta I concocted last night was the quality of the mint I culled from my garden. Because the mint plants are rather stiff and past their prime, I cut back on the amount, which had a beneficial effect on the result. 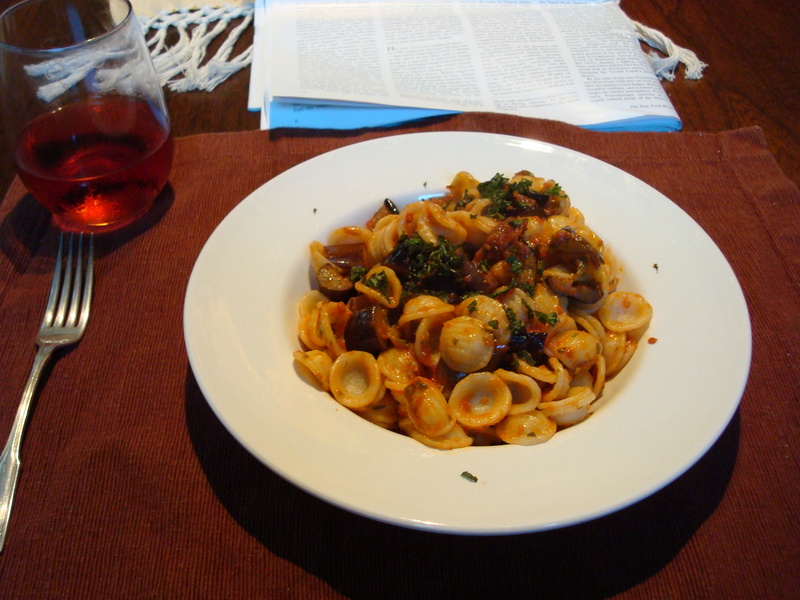 As for the sauce, this time, I decided to adapt one of Marcella’s other basic tomato sauce. It could easily become my favorite. Beginning with 6 pounds of tomatoes, I blanched them for 45 seconds and then peeled them when they were cool enough to handle. I chopped them up coarsely. Having only one big sweet white onion, I chopped it coarsely and added it to the tomatoes. Then, I cut up 10 tablespoons of unsalted butter, which I added to the tomatoes. Instead of simmering the sauce for only 45 minutes, I turned the flame as low as it would go and simmered the sauce for nearly two hours. The liquid reduced by half, which still left me a lot of sauce. After I removed the sauce from the heat and let it cool a bit, I put two and a half ladlefuls at a time into a food processor and pulsed it. Once I had processed all of the sauce, I froze most of it, but kept aside about a cup and a half. I cubed about a pound of Japanese eggplant. Pour very generous slugs of olive oil into a skillet. It will disappear in no time once I add the eggplant cubes. Eggplant always takes a good 15 to 20 mins on a medium-low flame to sauté to the point where the meat of the eggplant is caramelized sufficiently and the edges of the cubes are browned. For this reason, I don’t start the pasta water until the eggplant is nearly done but I start heating the water before I add the tomato sauce. When the eggplant is soft enough, I add the tomato sauce I’ve reserved from the batch I’ve made and then turned down the heat. I chopped a handful of mint, but only add half of it to the eggplant and sauce. While the pasta water came to a boil, I simmered the eggplant in the sauce, letting the sauce reduce and the fats to separate from the tomato sauce. Season with salt (I used my new favorite, Maldon sea salt, and it brighten the sauce right up). Into the water went the orrecchiete. When it was done, I drained it quickly but did not shake off much of the water. Right into the pan with the eggplant sauce and I stirred to coat. The pasta should not be smothered in sauce. As a final touch, I sprinkled the other half of the chopped mint. A bit of parmigiano binds the flavors, but don’t drizzle olive oil. You want the silky flavor of the butter to emerge. I’d love it if someone gave me a reason to follow Marcella’s direction to simmer the sauce only 45 minutes. I fear that the tomatoes would be insufficiently cooked. However you adapt this combination of flavors — butter, tomato, eggplant, and mint — I think its success depends on the butteriness playing the bass line along with melody of the other flavors. Hey Sally, two things: First, Mary H. swears by apple mint being the best for cooking, and I suppose the English know a thing or two about mint sauces. I’ve started growing it too, and I like it’s mellow flavor. Yesterday I added some to a Roman tomato and lentil soup, and I did the same thing of adding the mint in two stages. It worked well. Second: I think the reason for a short simmer of the tomatoes is that it retains their ‘fresh’ flavor (as opposed to the more stewed flavor you’d get from canned ones, which you’d want to simmer for ages to improve their flavor). You’ve got loads more high quality fresh tomatoes there to experiment with than we do, so I’m sure you’ve tried it both ways. It may be just a matter of taste. We cook fresh tomatoes just until they break down sufficiently and the acid mellows. I’ve never seen Apple Mint around here, but I will keep my eyes open for it. When the mint in my yard first comes up, it’s very soft and fragrant. As for the tomatoes, I get your drift about the flavor of fresh tomatoes. And you’re right, it’s a matter of preference and preferences change. Tomatoes sauces that are cooked for less than an hour often are watery. I like a thicker sauce. It doesn’t taste anything like canned tomatoes. The sauce I made a week ago is bursting with tomato flavor, even though I cooked it between 2 and 3 hours. Last year, when I had a lot of fresh tomatoes, I followed Marcella’s instructions to the letter. 45 minutes and off the stove it came. But I wasn’t happy with the sauce I froze. It was thin and watery. Now, that could be a problem with the kind of tomatoes I was using. Being dependent on the generosity of friends, I take what I’m given and I’m rarely given a lot of Roma tomatoes, which as you know are meatier and contain less liquid. And so we’ll revisit this question next summer when I hope to have a big crop of San Marzano tomatoes to cook up into a sauce. Watery sauce is a problem, I agree. Sally, I’ve now made 2 batches of sauce with the same tomatoes you’ve used. They have very good flavor but a lot of water, so I, too, cook my sauce until it’s reduced enough for my taste. I usually try to make sauce from roma tomatoes which I’m growing in my garden this summer. Although something I heard on The Splendid Table the other day is making me pay closer attention to the type of tomato I choose for sauce making. Lynn Rosetto Kasper, the host of the show, says she never uses romas for anything because they lack flavor. Huh. I’d never paid that close attention to differences. That’s funny. I just finished a batch of tomatoes. This time I cooked them exactly as long as Marcella recommended. What I wound up with was very flavorful stewed tomatoes with lots of water. Still, I decided to leave them that way. I can always cook them down more before using them. I wonder what kind of tomatoes Kaspar uses. San Marzano? It would be nice if someone more knowledgeable put in his or her two cents here. I’d like to figure out what kind of tomatoes to plant next year in anticipation of my new raised vegetable beds in my garden. San Marzano are just a type of roma. That’s what I planted this year. Once they’re ripe we’ll do some experimenting. I cooked 2 cans San Marzano tomatoes (Whole Foods; $3.29, 28 oz.) for 2 hours with a stick of unsalted organic butter and 2 large organic onions. Simmered it covered for 90 minutes, then took cover off for final 30 mins. Absolutely DELICIOUS!! I served with non-organic Hot Italian Sausages, flamed green peppers, and freshly grated BelGioso Provolone cheese. My wife walked in after cooking done and agrees. Rick, that sounds fabulous! You know, that’s what I’m going to do with the tomatoes that I basically stewed. But here’s a detail that I’m wondering about. Do San Marzano tomatoes actually have much flavor? According to Lynne Rossetto Kaspar, they don’t. Sherry and I talked about this on the phone (not on this blog) the other day. So, if roma tomatoes lack flavor, which tomatoes work best for sauce? And how do you deal with the water? It’s sad how obsessive we are. It must be tribal.